Summer is well underway, and now is the time to beat the heat! Here are a few tips to help you and your pets stay cool! Never leave a pet in a hot car, not even for 5 minutes! Never leave a pet in a hot garage or attic! Keep outdoor walks and playtime to less than 15 minutes at a time on hot days! Or, focus playtime on the early morning and evening hours when the sun is not high in the sky. Do not tether or keep animals outside for extended periods during extreme heat and always make sure there is shade when they are outdoors. Don’t walk dogs on hot asphalt. If it is hot enough to burn your bare feet, it will burn their footpads. If there is no air conditioning available, make sure there is a fan to increase air movement and prevent humidity from getting too high. If your animal has an illness, especially heart or lung disease, it is even more important to keep them out of heat and humidity as they can exacerbate the disease. Keep your pets protected from heartworm which is transmitted by mosquitoes. Keep your pets protected from fleas and ticks. We have many veterinary recommended products for this! Make summer fun! Water play and frozen treats (including plain old ice cubes) can make summertime more exciting! Send summer photos to our Facebook page! With summer also comes severe weather. Storm anxiety is very common in dogs. Some dogs will tremor, hide and drool. Others will be very clingy to their owner. Some dogs will even vocalize. With each passing storm and storm season, the anxiety just seems to get worse instead of better. Your pets will not get “used to” the storms. There are short acting anxiety medications available to help your fearful dog calm down. Please call our office to schedule a consult to discuss behavior modification therapy paired with anti-anxiety medication to meet your pet’s specific needs. If you go on vacation in the summer, do you take your pet with you? If so, you pet may need a sedative for the car ride. We can help with that too! And always make sure your pet is up to date on vaccines before traveling whether they are going with you or staying at a boarding facility. Sometimes the boarding kennel can cause anxiety in your pet just because they miss you or because the noise level in the kennels is louder than they are used to. Frequently the kennel visit can cause stress related diarrhea. Also many kennels feed different food than your pet is used to eating. We recommend always taking your pet’s regular food to the boarding facility. If you think your pet needs anxiety medication for boarding, please call our office to set up a consult. We want to help. 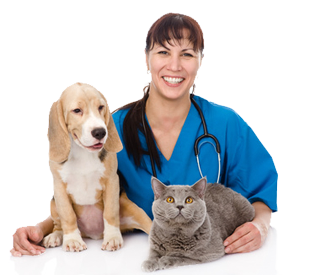 And if your animal does develop stress related diarrhea, we have treatments available for that too!